Due to Thanksgiving and to working on a new web site, I will not be posting anything this week. Once we get the new web site and blog up and running I will start posting again. 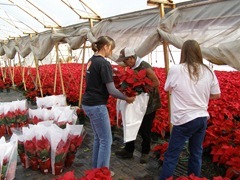 This week is our first week for shipping a lot of poinsettias. Packing poinsettias is a pretty straight forward process. We pick through the crop passing over any that do not meet our specifications. We remove any yellow leaves on the bottom side of the plant. Yellow leaves on the underside are typical. 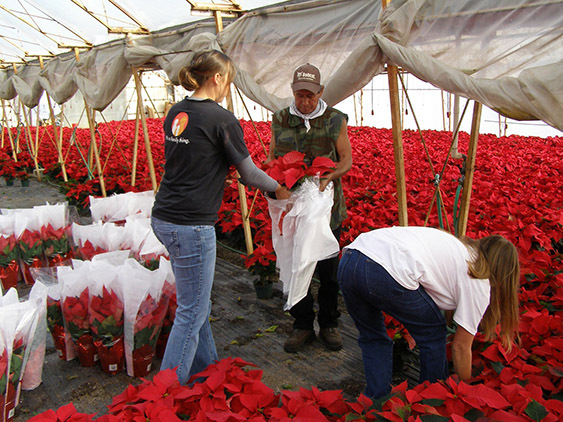 The leaves are the oldest and receive the least amount of light under the canopy of the poinsettia. 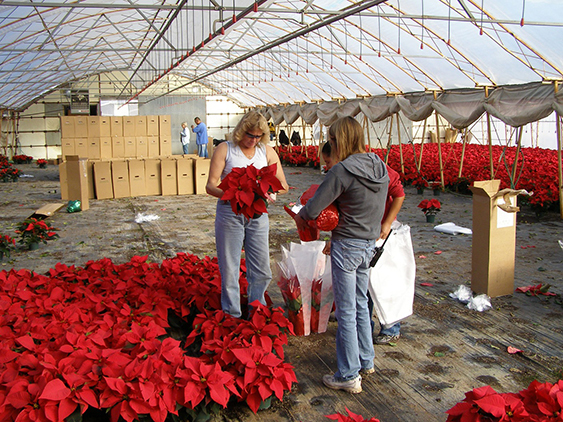 After that we place the poinsettia in a fiber/plastic sleeve and place the sleeved plants into a box for shipping. Once all the boxes are packed we move them to a central greenhouse for loading. 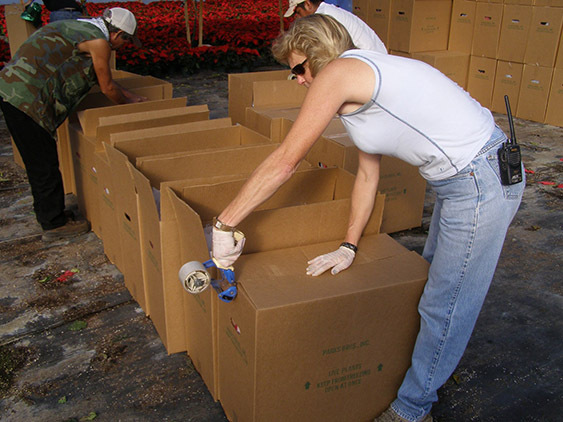 The boxes are labeled with color and size when they are packed then when they are loaded we place a colored dot sticker on each box that corresponds to a drop to facilitate quicker unloading at delivery. For instance the driver pulls up to ABC Garden Center, looks at his paper work and sees that they have 30 boxes on order that are marked with a red dot. The driver then unloads all the boxes with red dots, double checks the quantities and is on his way. 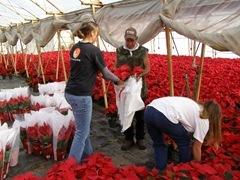 Here are some more pictures and a video of our crew packing poinsettias. I didn’t get around to doing any of the posting this week that I had planned. 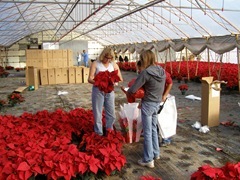 I’m taking a few days off and will be back next week with poinsettias and more! I’m back for a half day then gone agian until Tuesday. When I get back, I will post some more pictures of the poinsettias. They have really colored up this past week. Plus we will have a new website for our wholesale up and running in a few weeks that we will want everyone to check out and tell us what you think of it. I also plan on doing a post about some of the changes that have occurred in the chain store market and how those changes might affect us and you. 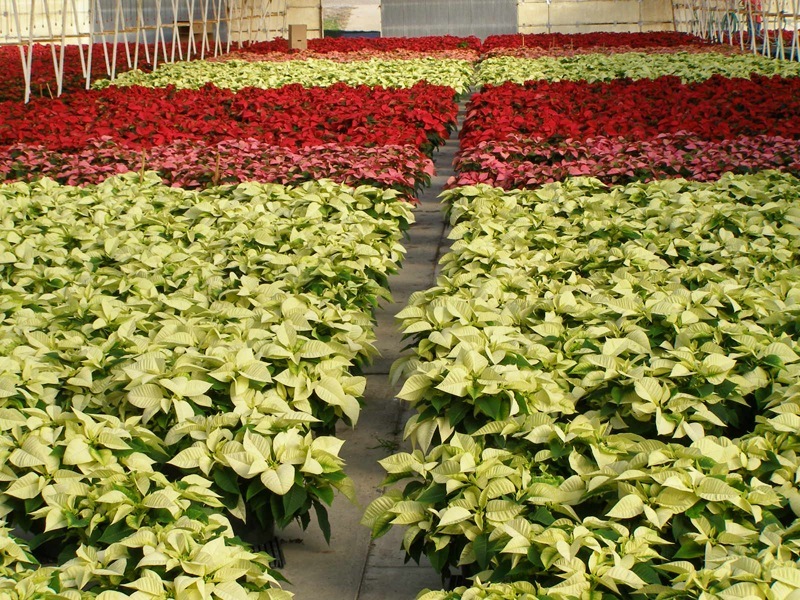 There will be new variety spotlights, more pictures and a few videos of poinsettias, plug production pics and more so be sure to check back to see what’s new!